Happy Mail from CAS-ual Fridays came today! Although Canadian Thanksgiving was last weekend I could not wait to ink up my new Amber Waves stamp set. It is always a good idea to have some thank you cards on hand. A kraft card base, Basic Grey Hipster patterned paper and that gorgeous bunch of wheat and of course I can't make a card without stitched matts. A really clean and simple card to put together, I love it when a stamp is the showpiece! I am also submitting this to the City Crafter Challenge Give Thanks. Gorgeous card Tracey! Love the neutral colour combo. absolutely fabulous! I love your card! yay for happy mail and new stamps.. this is gorgeous.. So beautiful!!! LOVING the wheat!! Love this, Tracey...what a beautiful image! Way to rock your new stamps! Beautiful! 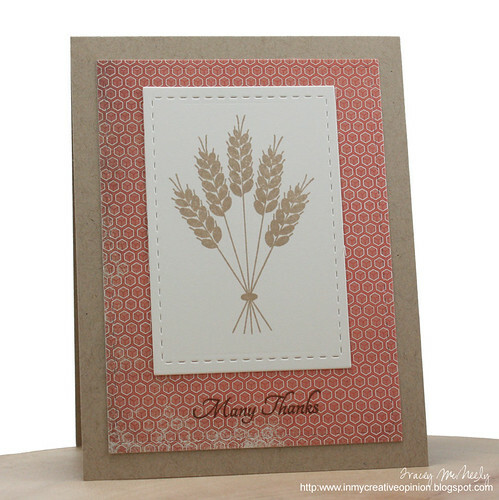 I love how you stamped the wheat image and mix it with the lovely pattern paper, Tracey!! absolutely beautiful! Awesome card for the challenge! Thanks so much for playing at CCCB! So PRETTY Tracey! The BG paper is perfect with this stamp. And look how perfectly the stamp fits in your stitched mat LOL!!! Fabulous card, Tracey...your stamp as center stage is spot on! Absolutely beautiful card, Tracey! The wheat looks fab with the stitched rectangle and the patterned papers are so pretty! You could not have made a more perfect Fall card Tracey...love the beautiful wheat stamp and also the patterned paper you chose for your background. What a fabulous card you made with your new stamps. I love it. And, a new challenge I have never heard of....need to go check that out. 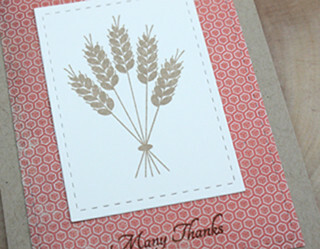 Love how you showcased the wheat and framed it with such pretty patterned paper! Tracey...just beautiful! I love that stamp and your background paper, simply a perfect combination! Looking forward to playing with mine too, thank you for the inspiration. Sooo loving this one, Tracey!! You totally rocked the CAS-ual Fridays Stamps!! Thanks for joining us at City Crafter Challenge Blog! So, so pretty, Tracey! LOVE the kraft and pink, and that wheat bundle image is AMAZING! I adore your style...CAS but never incomplete. Gorgeous!